Ever wanted to experience the thrill of danger from the comfort of your own reading space? Thomas fuels his writing with true life experience – from being chased by frenzied sharks, to being bitten by eighteen-foot pythons, and having survived more than a few near-death experiences. He lives for adventure and spends his free time studying wildlife, reading, writing and pushing himself to extremes whether it’s scuba-diving, free-diving, shark-diving, spearfishing, capturing feral species in the Everglades, fossil hunting in the alligator infested waters of Florida and more. Thomas has a true love for the natural world and has studied wildlife biology and natural sciences. His writing influences are the likes of Stephen King, Robert McCammon, Dean Koontz, James Rollins, Clive Cussler, J.R.R Tolkien and more. Action, adventure and horror are his genre favorites. In his writing you will find swashbuckling thrills, chills, adventure, horror, war, werewolves, historical fiction, Nazis, serial killers, paranormal, wildlife, conservation, twists and unexpected turns, and there is often a hero among the rubble - standing up to the various injustices of humanity. Thomas understands writing can be mundane at times, but he yearns for the build up to the vivid action and gratuitous horror sequences, and the ability to convey a greater message to mankind. True life experience is key to the climactic intensity of his writing. In Search of the Lost is a work of historical and contemporary adventure fiction written by author Thomas W Peltier. In a split narrative between present day Tasmania and Tasmania during the 1930s, this thrilling and dramatic work weaves a narrative around the fearsome predator that is the Tasmanian Tiger. In the thirties, rancher Joe McPherson leads a campaign threatening the tiger into extinction, which soon turns into a mad race for blood money among less scrupulous people. This in turn forces Greg McKinley, owner of a rescued tiger pup, to begin an incredible journey in the Outback. Meanwhile in the modern day, biologist Conner Williams is fascinated by the tigers, and embarks on a quest which also sends him into the Outback to make a startling discovery. Thomas W Peltier brings Tasmania to life time and again in this fascinating and lively look at the culture and creatures of a truly unique place. The transitions between the past and the present story lines were fluid and very well handled, and I found the dialogue of the characters to be particularly reminiscent of Australia, giving a really immersive and enjoyable atmosphere to the tale. The plot leads to some very startling and unexpected conclusions as the old legends of the Aborigines clash with the truly wild nature of Australia and its deadly animals. 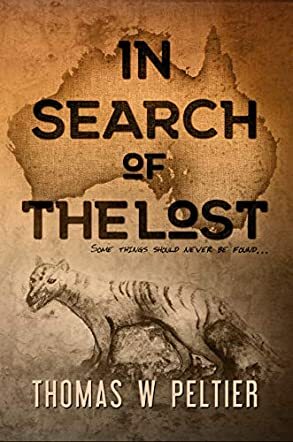 Overall, if you’re looking for a new adventure novel with ancient legends, daring feats and exciting discoveries, choose In Search of the Lost for your next read.